A beginner’s guide to creating your own photography website in WordPress. Learn how to add your photography portfolio, add your photography logo, create galleries, and make money with your website. Do you want to create a photography website? WordPress makes it super easy for you to build a beautiful website for your photography business WITHOUT hiring a developer or learning how to code. 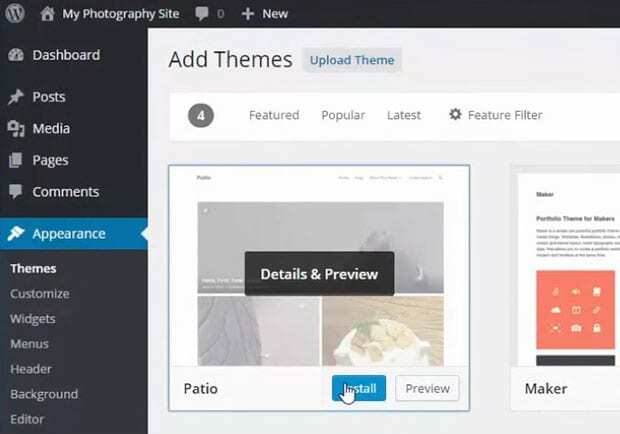 In this article, we show you how to create your own photography website in WordPress step by step with no steps skipped. On top of that, we will guide you through every decision, so you don’t waste your money. With the money you’ll save on your website, you can spend more on photography gear (camera, lens, editing software, etc.) and other investments to grow your business instead. 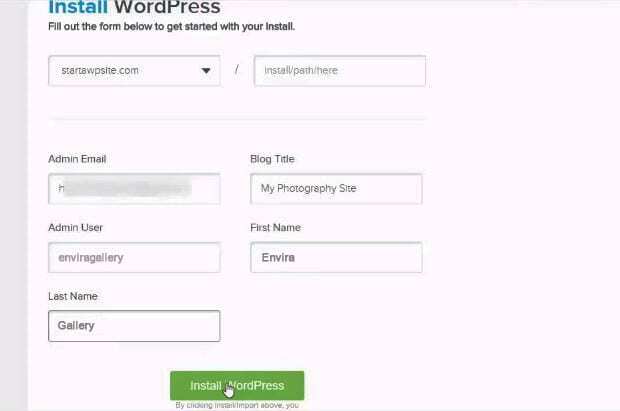 Simply follow the step-by-step instructions below to create your photography website in WordPress. Since this is a long and detailed tutorial, you can use the navigation below to skip to the appropriate section as needed. 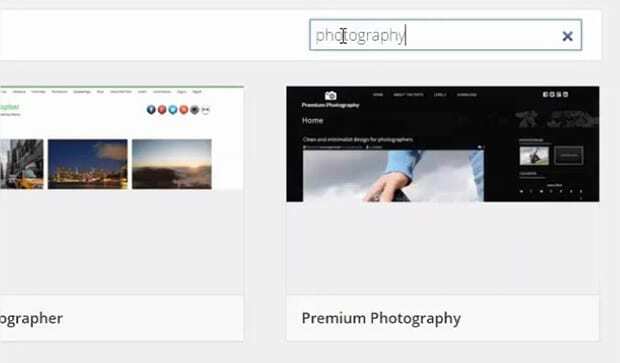 First thing you need to create a photography website in WordPress is to setup your domain and hosting. Web hosting is a computer where you upload your website, images, etc so others can see it. Every website needs web hosting. 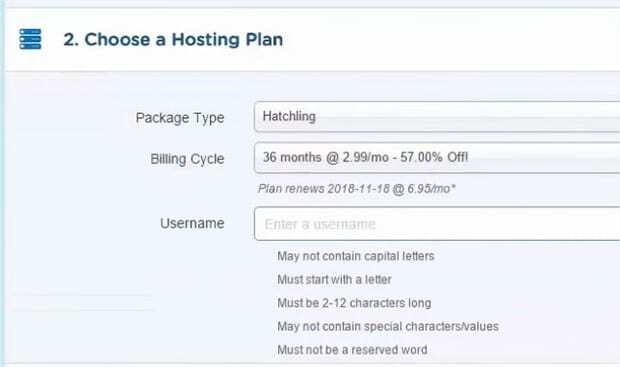 While there are tons of domain registering and WordPress hosting companies out there, we recommend you to use Hostgator when you’re just starting out. You can also check out the other options with pros and cons listed here. Why? Because it will save you a lot of money. Normally hosting can cost anywhere from $10 per month to hundreds of dollars a month. When you’re just starting out, you don’t need the additional resources so don’t waste money on that. Hostgator is offering our users an exclusive 57% off discount. To get a hold of this special price, you can simply click here to go to Hostgator. 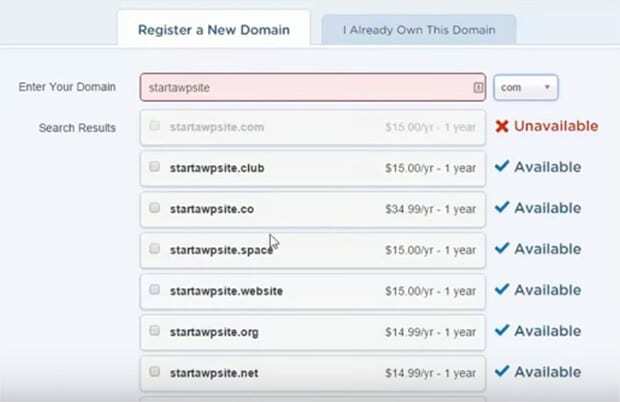 After you click on the “Buy Now” button, you will then be asked to register your domain name. Simply type in your desired domain name to register it. If the desired domain is not available, then you will see the suggestions to choose from. We usually recommend using .com domains because they’re easy to remember. Once you have selected your domain, scroll down a little to select the hosting plan you want. The Hatchling plan has more than enough resources for a new site. While you get the best price by pre-purchasing 36 months of hosting, we normally don’t pay more than 12 months. First, because it requires less upfront capital investment. Second, when your website grows and gets thousands of visitors a day, then you would need to upgrade to a larger plan or managed WordPress hosting like WPEngine. Once you have selected your domain name and hosting, go ahead and finalize the purchase. You can unselect all the additional “upsell” services because you don’t need those. If you change your mind later, you can always purchase them from inside your control panel. Make sure that the coupon: ENVIRA is entered in the coupon field because that will guarantee you the best price. After purchasing your domain and hosting, check your email to find the credentials to access your Hostgator account. 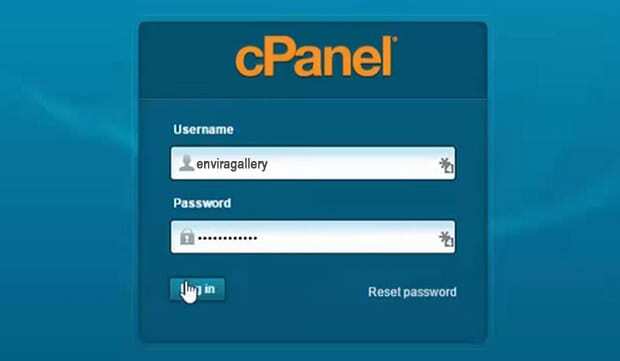 Simply login to your website cPanel account using the details in your email. Once you are logged in, go ahead and scroll down to find QuickInstall and click to open it. 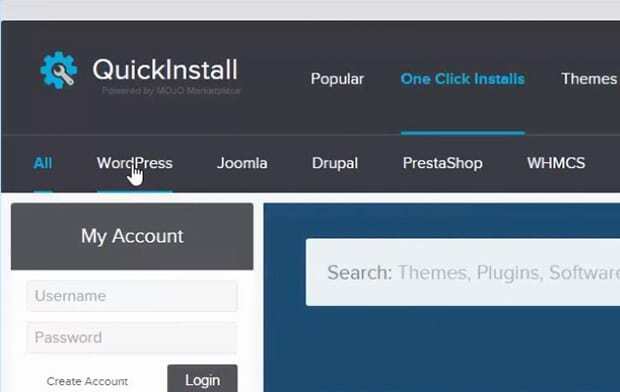 Inside QuickInstall, you should select WordPress from the top menu bar. 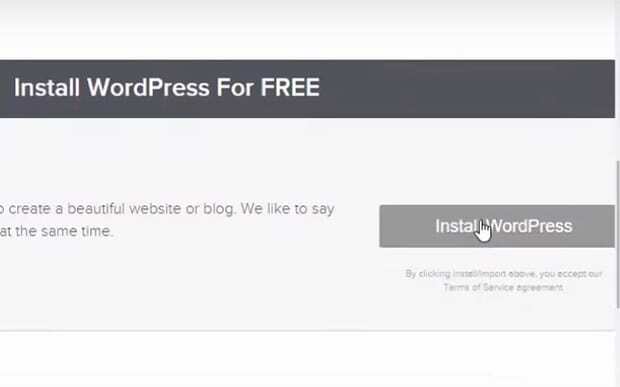 Now simply click on the Install WordPress button. Once you are satisfied with your details, make sure to hit the Install WordPress button. A window will appear with the information that includes the admin URL, username, and password to access your WordPress dashboard. 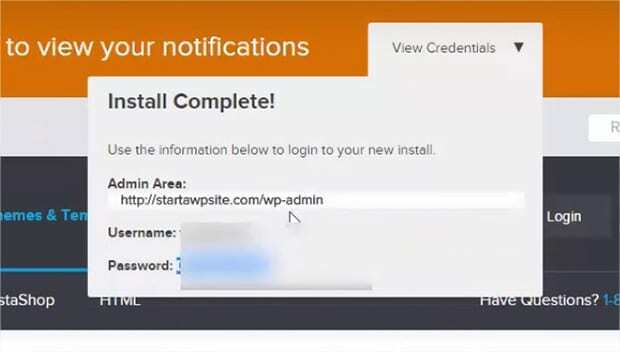 Now go ahead and login your WordPress admin area using the above information. 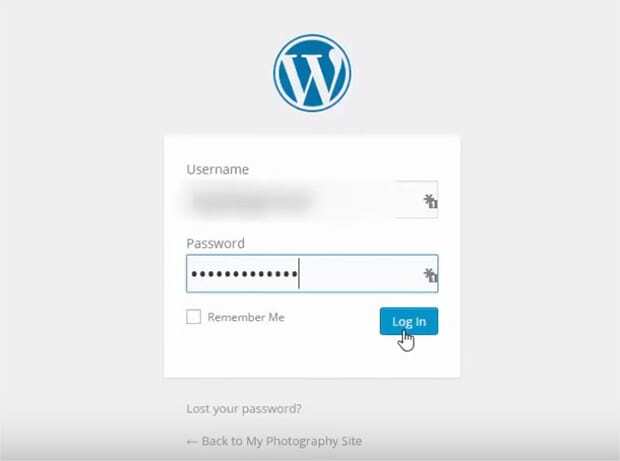 Once you’ve logged on, you are ready to build your photography website in WordPress! Choosing the best WordPress theme is very important. A theme is basically your website’s design template. WordPress comes with thousands of free and paid options. 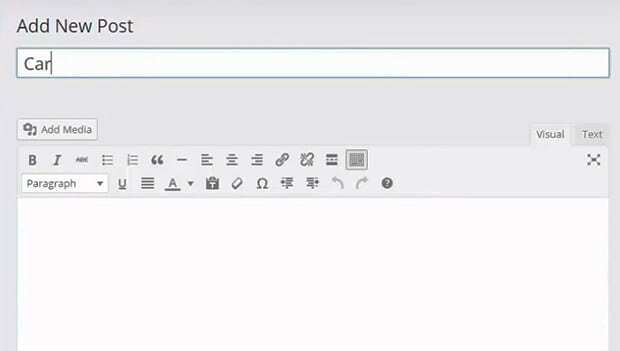 WPBeginner has a great article on 9 things you should consider when selecting a perfect WordPress theme. Since we know the decision of choosing a theme can be overwhelming, we made it easy for you by creating a list of the 55 best free WordPress photography themes. For the sake of this tutorial, we’re using the Patio Theme #5 in our list above. You can install a WordPress theme in your admin area by going to Appearance » Themes and clicking on the Add New button at the top. Write ‘photography’ in the search bar and hit the enter button. We are selecting the Patio photography theme. It is a beautiful WordPress theme for photographers. 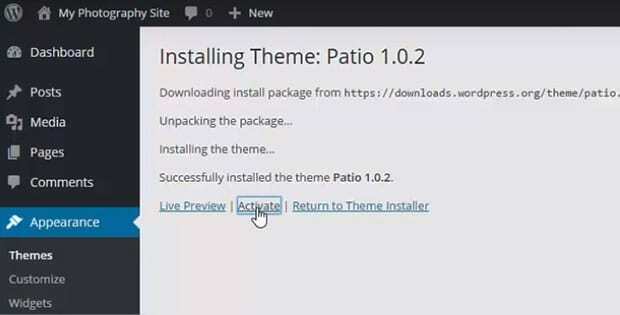 You need to click on the Install button from Patio theme and then click on the Activate link from the next screen. 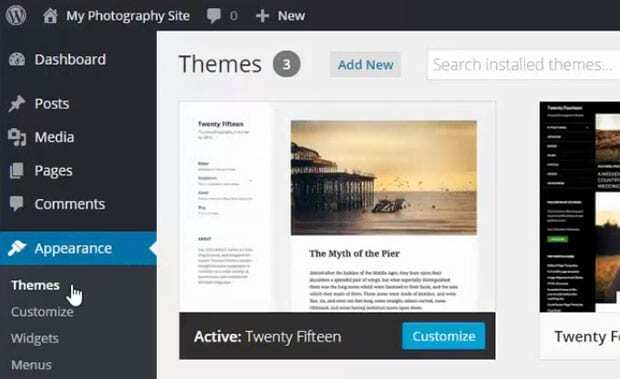 Your photography theme is now installed and activated in WordPress. After activating the theme, you can go ahead to Pages » Add New to add your website pages one by one. You can edit these pages later to add your website content for each page individually. Some pages you can start with are “About”, “Services”, “Gallery”, and “Contact”. Leave these page blank for now but make sure to publish them. Once you have created a few pages, simply go to Appearance » Menus to create the menu for your website and click on the ‘create a new menu’ link. 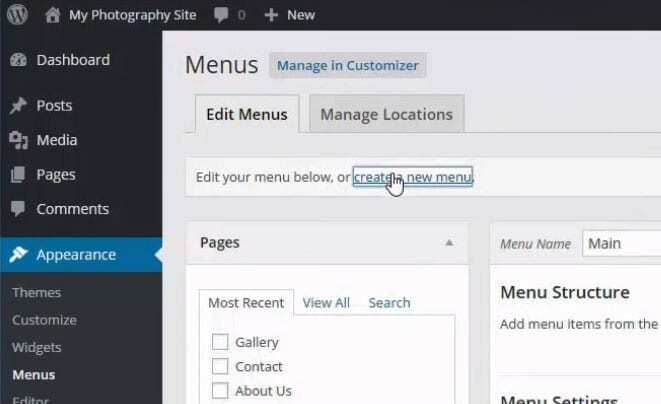 You will need to give a name to your menu and click on the Create Menu button. 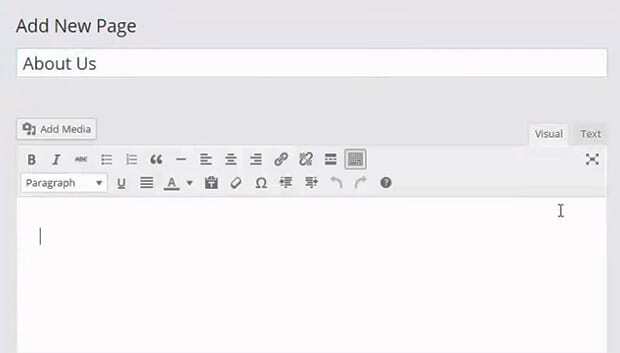 It will add all your pages in the new menu by default. You can remove any unwanted pages by expanding the menu item and clicking on Remove. To change the positions of menu items, you can drag them up or down to get the order you want. 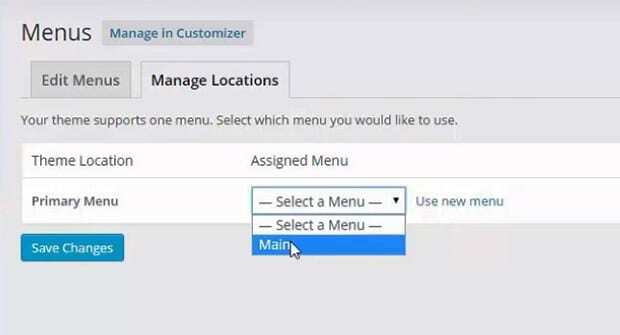 Next, go to the Manage Locations tab and select your menu from the Primary Menu dropdown. Make sure to save the changes. 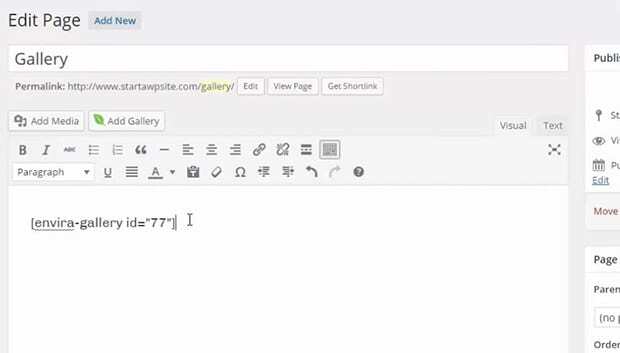 Once the pages are added, you can go to Posts » Add New to add a new blog post in WordPress. You can edit these posts to add content and images for display on your photography website. 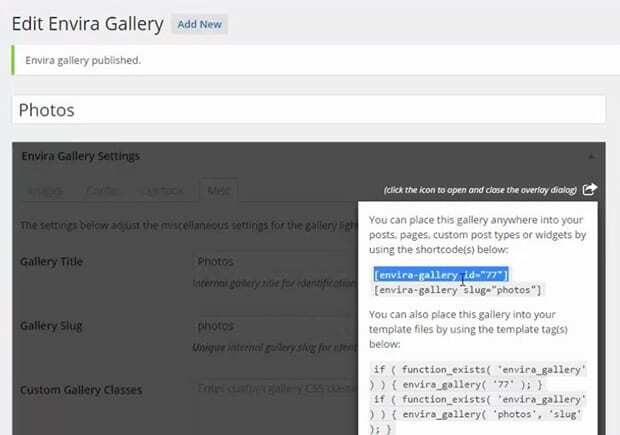 You can add photos in WordPress by using the default Media Library (Media » Add New). By default, the file upload size is 2 MB in WordPress. However, you can increase it by putting in a request to your hosting provider, or check out our guide about how to upload large images in WordPress. While the photos you upload here can be used in a post or page, it’s not the best way to create galleries or portfolios. Since most photographers have tons of photos that they want to organize in a gallery / albums and sort them by tags, you need a gallery plugin. We created the best WordPress gallery plugin. This comparison shows that Envira is not only the fastest but also the most feature-rich when compared to our competitors. To create visually stunning image galleries for your website, go ahead and install the Envira Gallery plugin. You can do this by going to Plugins » Add New and search for ‘Envira’. 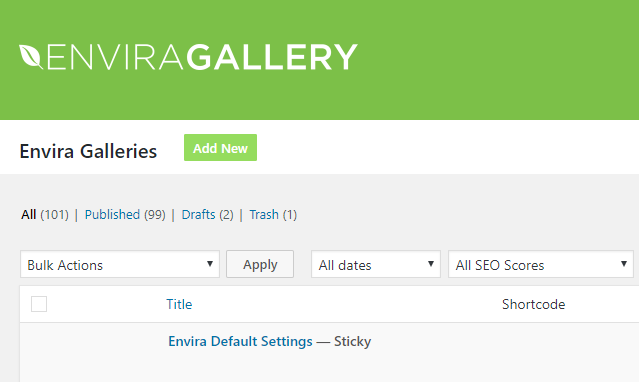 It will show you the option to install the Envira Gallery plugin. 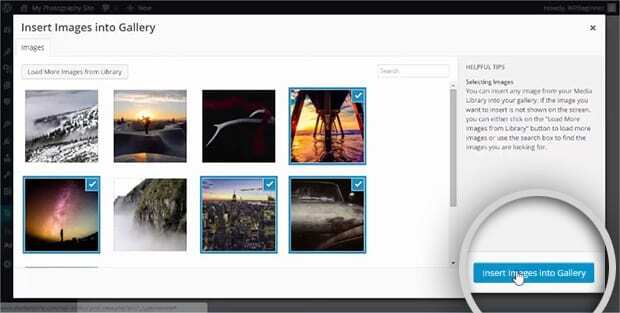 In the next step, go ahead and activate the plugin to start creating beautiful image galleries. After activating the plugin, go to Envira Gallery » Add New to create your first image gallery. 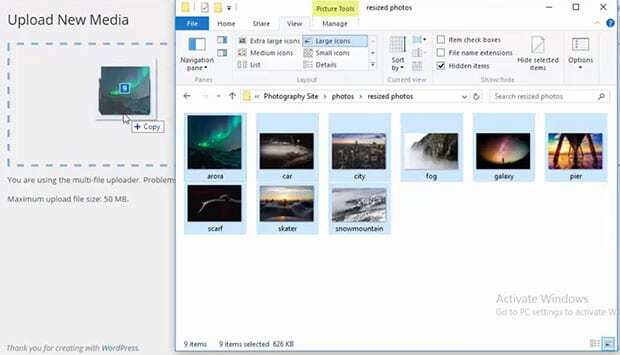 You need to start by giving a name to your image gallery, and then drag and drop your photos in the images section. A popup will appear with all your uploaded photos. You’ll need to select the images that you want to include in this image gallery, and click on the Insert Images into Gallery button. Once the images are added, you can go to the Configuration tab to change the settings for your image gallery. 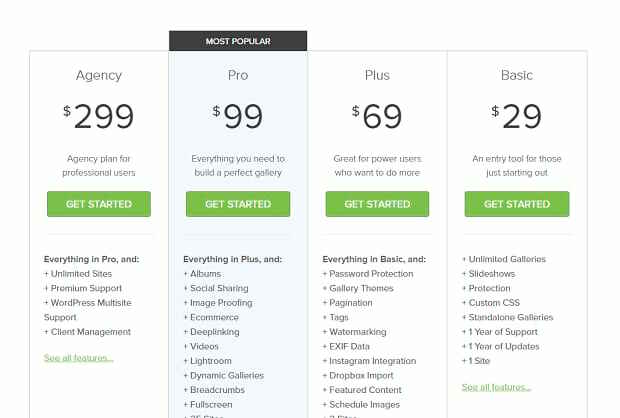 These settings include number of columns, gallery theme and more. Unless you want to make any changes, the settings are good as-is for an image gallery in WordPress. Simply click on the Publish button and your new image gallery is ready. Now go to Pages, and edit your Gallery page to add the image gallery. In the page edit screen, paste the shortcode for your image gallery into the page body and click on the Update button to save. Your image gallery will now appear on your Gallery page! 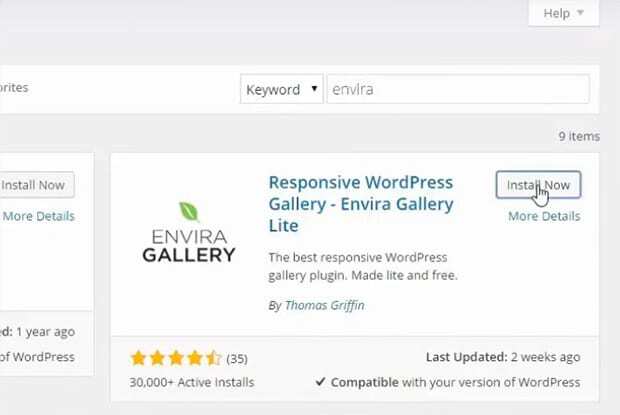 Envira Gallery has a premium version that comes with tons of amazing features such as Albums, Image Tags, Watermarking, Adobe Lightroom to WordPress integration, Social sharing, Image proofing, Ecommerce, and more. You can simply go to Envira Gallery Pricing page and choose a plan. Once you get the details sent to your email, go ahead and login to your Envira Gallery account. Next, go to Downloads for downloading the latest version of Envira Gallery. A zip file of the Envira Gallery plugin will be downloaded to your computer. Next, you need to go back to WordPress admin and go to Plugins » Add New. 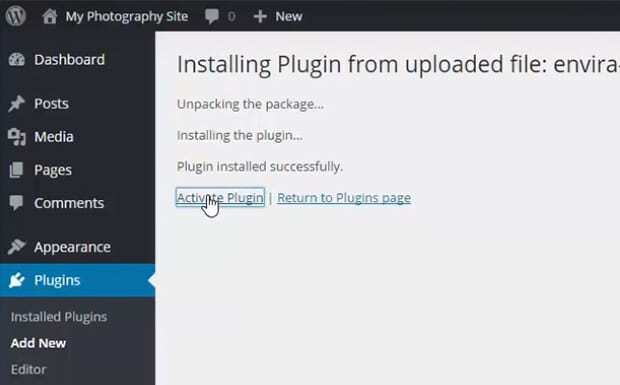 Simply click on the Upload Plugin button. 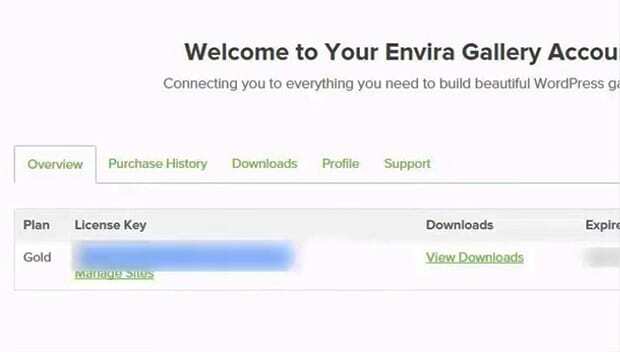 Choose the Envira Gallery plugin zip file that you just downloaded, and click on the Install Now button. In the next step, simply activate the plugin to enjoy the amazing features of Envira Pro. After activating the plugin, go back to your Envira Gallery account and copy your License Key from the Overview section. 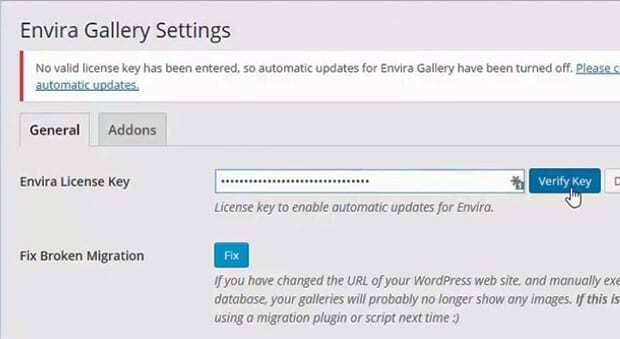 Go ahead to Envira Gallery » Settings and paste your License Key. Hit the Verify Key button. Once your License Key is verified, you are ready to use all the features of Envira Gallery that come with your Envira Pro plan. You may want to check out our guides on a few great addons for photographers, including video gallery, social sharing, import photos from dropbox, watermarking images, gallery pagination and more. Search Engine Optimization helps you get more exposure by getting your website to rank higher in the search results of Google and other search engines. 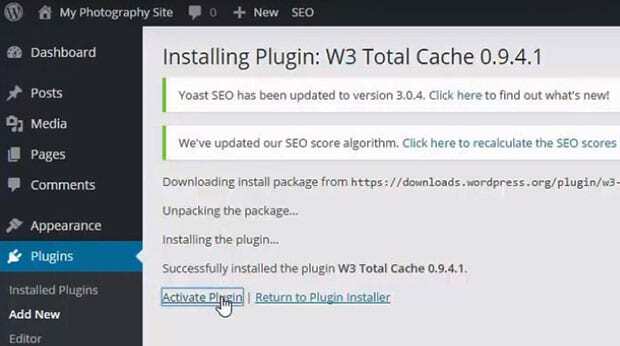 We recommend that you use the Yoast SEO plugin. It is the best SEO plugin for WordPress. 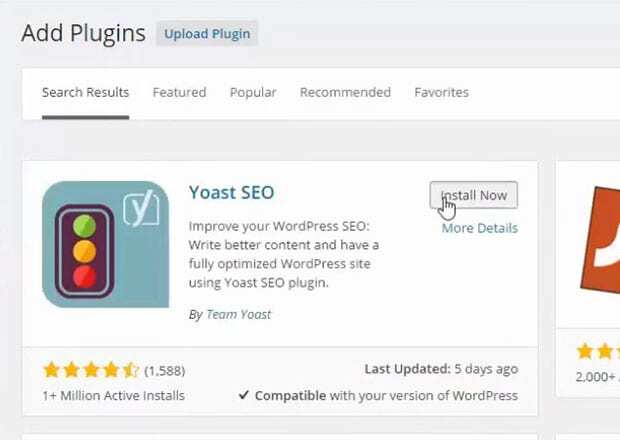 To install Yoast SEO, go to Plugins » Add New and search for ‘yoast seo’. Click on the Install button. 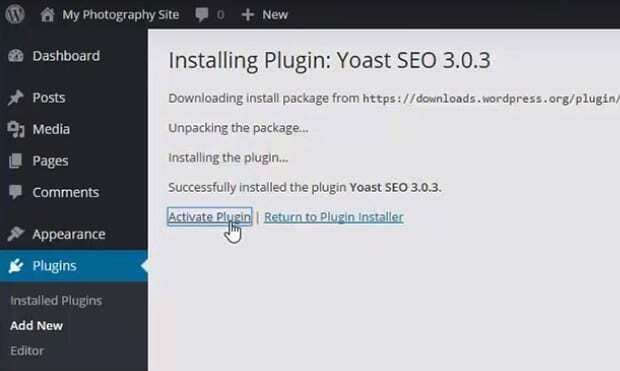 In the next step, click on Activate Plugin to activate the Yoast SEO plugin. Upon activating the plugin, you will find a new tab in your WordPress admin sidebar menu entitled, ‘SEO’. 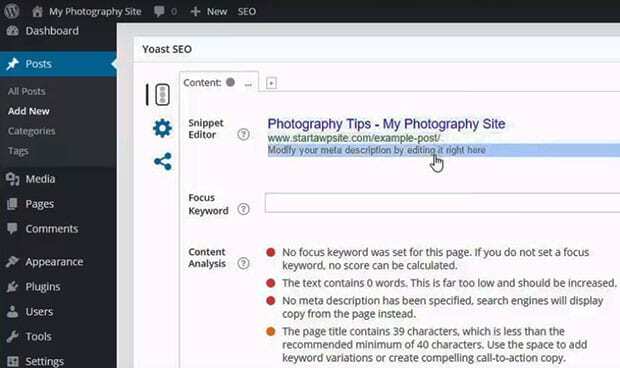 By default, Yoast SEO settings are great for helping your website and photos to rank in search engines. 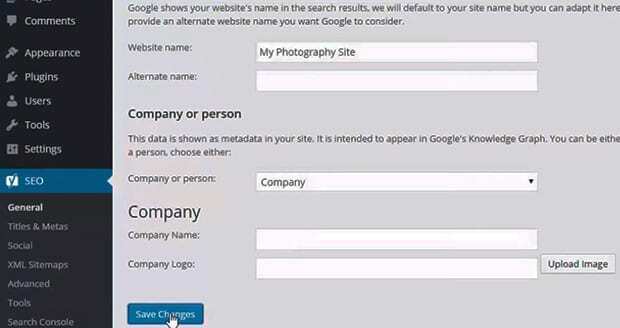 However, you’ll need to add some fields by going to the Your Info tab from SEO » General. Once you’ve added your settings, you can save the changes. 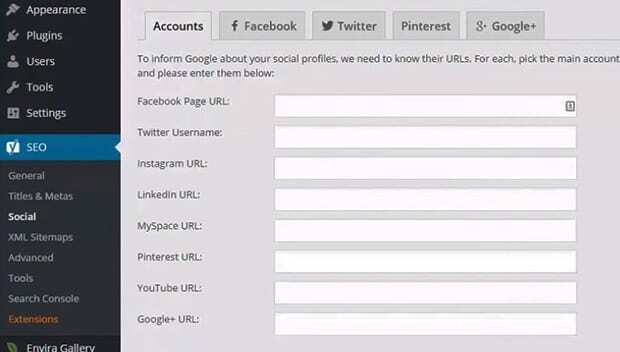 Next, go to SEO » Social and add in your social media accounts. The other settings don’t need any changes. You can go to your Posts or Pages and then edit them to find the Yoast SEO section. In this section, Yoast will show you how your post will appear in the search engines. Go ahead and add your Focus Keyword for the post or page (this is the search term that you want Google to display your post or page for). Below the Focus Keyword, you will see some bullet points. This Content Analysis information will give you helpful tips to improve your ranking. 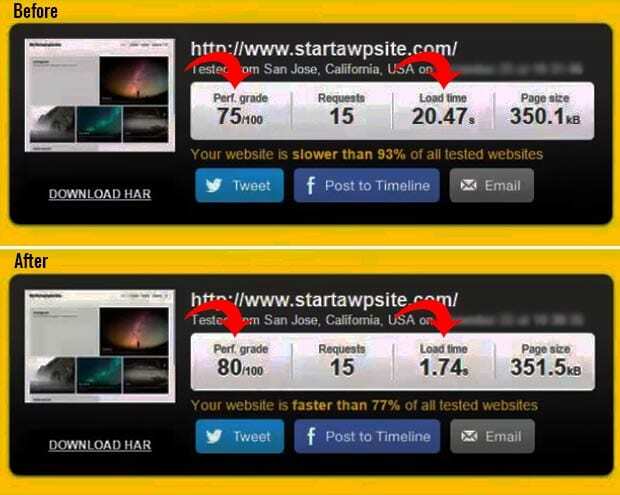 You can test your website speed simply using the Pingdom Website Speed Test tool. 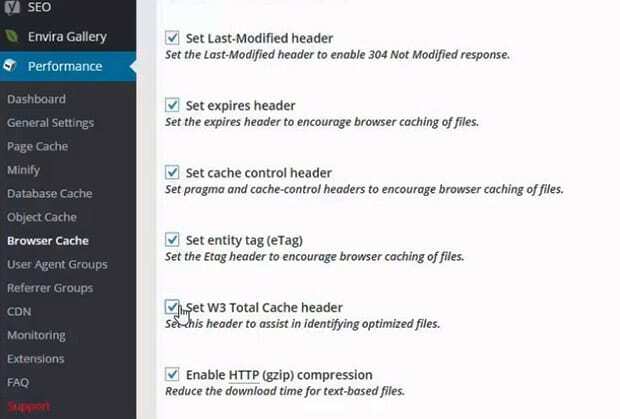 To increase the performance of your photography website, you’ll need the W3 Total Cache plugin. Go to Plugins » Add New and search for ‘W3 Total Cache’. 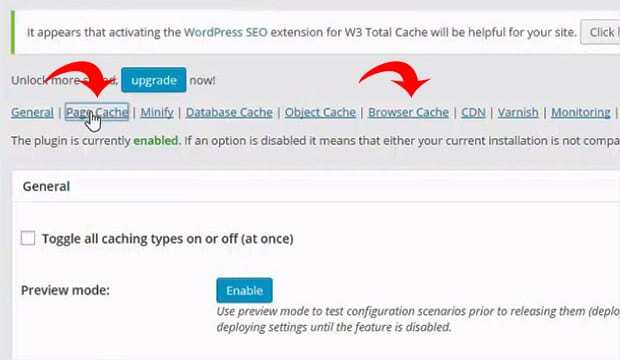 Click on the Install button for WP Total Cache to proceed. Next, hit Activate Plugin to activate the W3 Total Cache plugin. Upon activating the plugin, a new tab called ‘Performance’ will be added to your WordPress admin sidebar. Simply go to Performance » General Settings to enable the Page Cache and Browser Cache respectively. You can find both of these links in the top menu under General Settings. Once these settings are enabled, the web browser will save your website data, including your images, content and more, so it loads faster the next time someone visits your website. In the next step, go to Performance » Browser Cache and enable all the settings, except for 404 error. After checking the boxes, make sure to save all the settings. Now go run the Pingdom test again to see how your performance has improved. We did a test and then shared the results below. There is a lot more you can do other than just showing your photos on your photography website in WordPress. Things like adding a contact form, building your email list, adding a slider, and so much more. You should check out these 21 best WordPress plugins for photographers to make your website stand out. 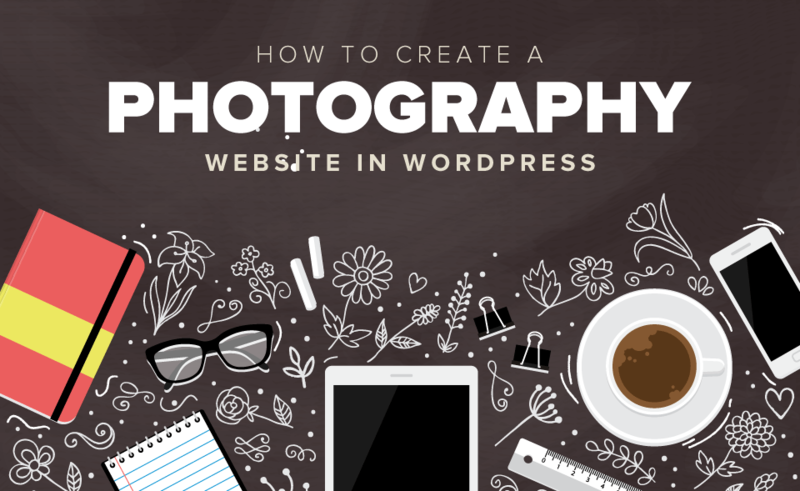 We hope this article has helped you learn how to create a photography website in WordPress. As you are building your photography website, make sure that you avoid these 12 mistakes. Once you are done building your website, you may also want to check out these resources that will benefit a new photography website.